Today has to be a nice day for an article about something that you can’t possibly do with an iPhone. Simply because it totally lacks one feature. Namely, high quality video recording. I take absolutely no responsibility for the damage you might cause as a result of trying to do something similar to what we have done in this article. I just spent a week on the western coast of Denmark. To be precise, in Klitmøller. A very nice place. Known for wind and great surfing in addition to nice family friendly summer homes and a fresh west coast nature. I’ve been pretty offline and spent the days with my family relaxing. But there’s always time for some important experiments. My experiments usually include images or gadgets. This time I had an idea about some spectacular aerial video shooting. The combination of my brother-in-law, Dr. Jacob Torgersen with a PhD in genetics and an extended interest for windsurfing, a Nokia 6630 test unit, a Nokia N95 main unit, a kite, some wind, my degree in media engineering and a big roll of duct tape should be enough to manage some interesting tests. The Nokia N95 has excellent video recording capabilities, so in addition to all of the other stuff it can do it is a very light weight video camera. 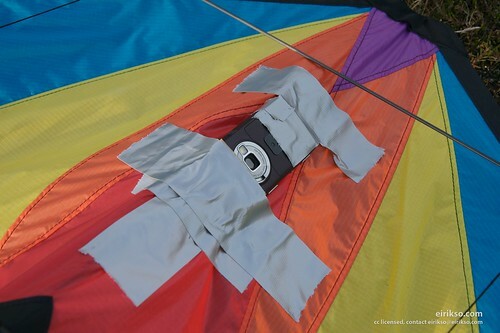 Of course it is a bit risky to send a $500,- phone up in a $30,- kite but we have a lot of duct tape. And everything can be solved with a lot of duct tape. First, we measured the balance of the kite and found the best place to mount the phone to avoid instabilities during flight. Then we mounted my old Nokia 6630 as a test unit and sent it up. 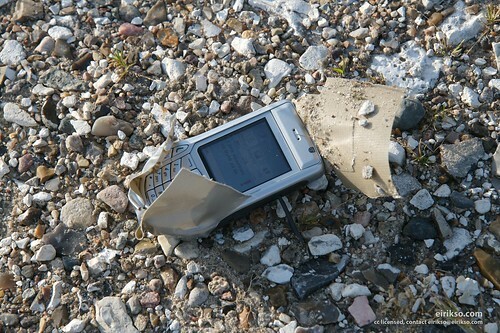 Everything flying smooth until the first serious vibrations sent my 6630 down into the gravel from about 20 m. The first result of our tests is a fact: a nokia 6630 survives a 20 meter drop with minor scratches. Amazing. And our first conclusion: not enough duct tape. We’re not very patient when it comes to experiments like this and Dr. Torgersen seems very confident in his kiting skills. Time to mount the Nokia N95 and get some better quality video. More duct tape this time. The kite goes into the air. Dr. Torgersen puts his years of experience with windsurfing and probably a bit of genetic science behind the navigation and we end up with a pretty cool video. He even manages to land the thing quite smooth and I am still a happy user of my undamaged Nokia N95. Yes. It flies. And you can download the original MP4-file as it looked directly from the Nokia N95 here. And when you watch the video on your Nokia N95 maybe you would want to connect a big screen. Bigger than the iPhone. Off topic: John Smith sends his regards. Does the N95 have a lanyard lug? I have a Samsung SCH-u740 which has a lanyard attachment point which I’ll definitely use as a backup to the duct tape if I try this. If the duct tape fails, the phone will hopefully just dangle instead of falling. Yes it has a lanyard lug. That’s a very good idea. Use it to secure the phone in case the duct tape lets it go. um…it’s kinda cooler than the other guy did. He put N95 on a model airplane and did air survey. I might try my very own N95 too. 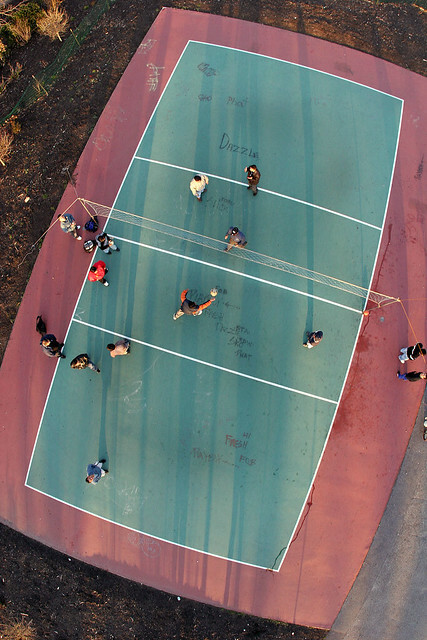 Google KAP or Kite Aerial Photography. It’s been around a long time but nice to see mobile video being added! There’s some very advanced rigs out there but you’re right about the duct tape. Keeping the great candle wax and thread approach going strong. Fantastic. Truly fantastic. I knew I wasn’t the first one doing this but the fact that Kite Aerial Photography is such a big thing was new for me. Thanks. We’re not insane. A 400D with lens in a Kite. Now that’s insane. Could be fun to try it with the camera’s timelapse function to get some nice 5mpix aerial shots. If you are really into this, you wanna help us test our software. We have a python program which will trigger the camera, capture the gps loc and create KML for Google Earth. 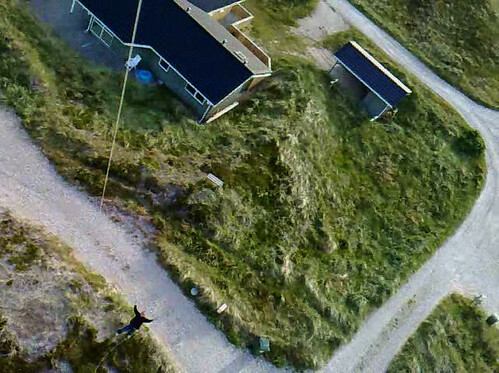 How about using a Canon 20D as a camera suspended from a kite line. Add a lens, some kind of remote system to control the cam…..
Jeff: can I buy your software somewhere? Didn’t find a link on your page. Wicherd: Now that’s very cool. The 20D can stand some beating, but I wouldn’t send a $1000,- camera into a kite anytime soon. Still, a very nice image! Man I feel disy! But here you have done something thats mixes three ideas at once! I have earlier seen some videos on “will it blend?” and due to the large wind it feels like you have duct-taped a blender with your N95 inside and installed it on your kite!! – Can’t stop my sight from spinning after watching that video! 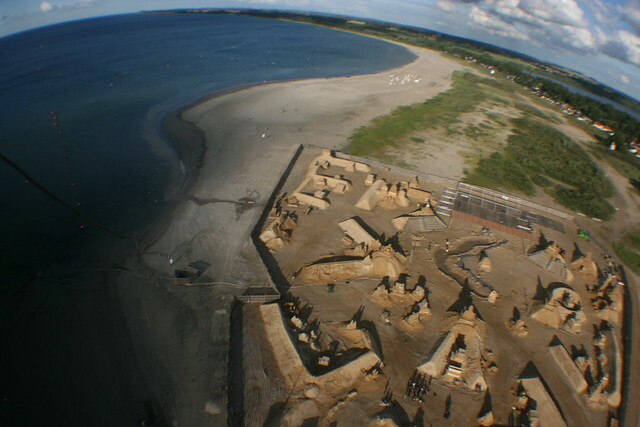 Denmark is without a doubt a nice place to be in the summer! Just been there for a week, but the weather was not that good! Very nice coast nature as you mention! Saw kite for sale everywhere! 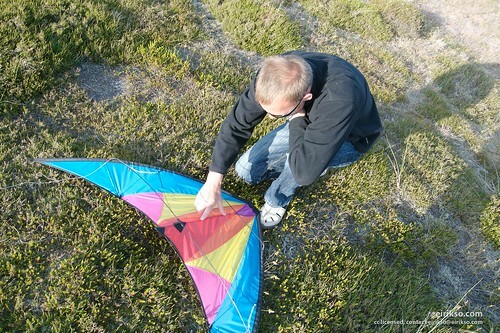 …sending whatever up in a kite. LOL. That’s not an N95. I have one and it looks different from the one in the pics for sure. The first pictures are of a Nokia 6630, the later ones is an N95. Exactly. If you read the story you’ll see that I did a test fligt with my old Nokia 6630 before I sent up my N95. Riprese aeree a basso prezzo (se si accetta l’eventualità di fracassare il telefono all’atterraggio)…. And use Wavelog to post text, photos, videos and sound to your WordPress blog! 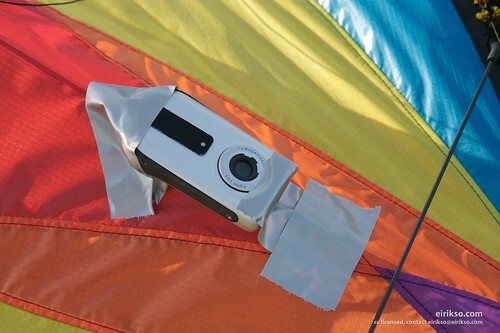 I don’t think i’d risk putting my HTC windows-powered device up there in a kite, nevermind my n95! But I do have to say, the video looked pretty sweet, I could only imagine doing this over water (omg what if the camera fell out??) or over a canyon.